For those of you interested in how my new adventures in data science are intersecting with my old adventures in tattoo history, you can visit my Github to read a long technical report on a work in progress. I’ve created a prototype popularity calculator that works by using historical book data from OCLC’s Worldcat (books with a keyword stem of tattoo* published between 1850 and today). When it is up and running in its final form, users will be able to try out different book titles to see which might lead to bigger archival holdings in libraries. Here’s a taste of some of the predictions that the current model outputs. I think where you really see the model start to shine is at the bottom of the test sample. 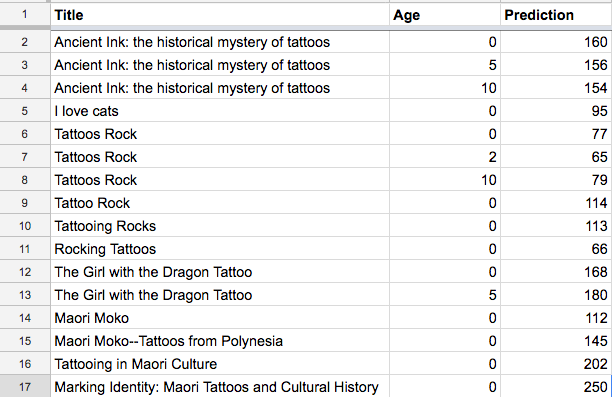 Given that the training data for the model is holdings in libraries, many of which are academic libraries, you can see that for four different title variations for a book about Maori tattooing, a slightly more academic title has the greatest popularity. 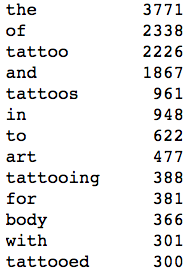 More tests are needed to see if this holds true for all books, or if the model can predict that a sub-genre like Maori tattoos might have more academic interest than some other type of tattoo topic. And note, The Girl with the Dragon Tattoo was actually not part of the data set for training because it’s extreme popularity made it a serious outlier. So it was interesting to see where that might have ranked had it not experienced viral popularity. I’m definitely open to help getting it up and running on this site as well as the Center for Tattoo History and Culture. So if you are a programmer/developer type and want to help, feel free to reach out (or just submit code to the Github). Looking forward to more adventures in digital humanities work in the future!